Over 50 people interested in learning more about local community gardens ventured out in the frosty temperatures last night to visit the Central Library for a documentary screening and information session. It’s tough to imagine with the snow heaped around us but for gardeners this is certainly the time to start planning! The documentary, titled “A Community of Gardeners”, presented a history of the community garden movement in the US as well as a depiction of several different gardens currently operating in Washington, DC. It highlighted the many benefits of community gardening – food security, community-building, neighborhood revitalization, social inclusion, healthy eating, exercise, and much more. The event was hosted by Steve Green, the Windsor Essex County Community Garden Network Coordinator. 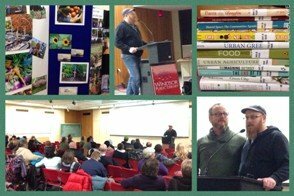 His passion for and knowledge of the local community garden movement was evident to everyone in attendance. Many were surprised and excited to learn that this year there will be 30 community gardens in Windsor and the surrounding area! If you’re interested in learning more about local community gardens visit www.wegarden.ca. There is even a handy map towards the bottom of the page with the location of each garden, making it easier to find one closest to you. You can also email Steve Green, the Network Coordinator at steve@wegarden.ca with any questions. And of course, Windsor Public Library has a large collection of books, DVDs and other materials related to community gardening and eating locally. We’ve put a small sample below.